The Authenticity Experiment, the friend edition. I said to my friend Biz, “I don’t have any new friends. In fact, I have hardly anybody at all that I do anything with.” It might have been the tiniest hyperbolic, but only just barely. And so, lately, even though she isn’t on the Facebook, she’ll remind me of things I’ve done with my friends. “Oh, was that not a friend you went to the Portland Center Stage with last week?” Or, “Did you do that ride alone? Oh, right, you were with a friend. Did I get that right?” Then there’s, “Were you by yourself at Listen to Your Mother?” And I am forced to admit that no, no I was not alone. I am not alone. Even if I feel alone, I am surrounded by people who love me. Even the ones I just met, like the cast of Listen to Your Mother (LTYM). But when you’re an ambivert—which is equal parts extrovert and introvert—you often feel alone inside. And when you’re on the Facebook and you see the curated pictures of lives—for the love of Jesus, the very reason for this blog—you feel alone. And when you are crying and exhausted on the Friday after the LTYM show and you really want this one specific friend to come have burritos with you at the river, but she is busy and you can’t exactly get the words out that that is what you want because what if she says no (and then you’re truly so alone), and really there is no one to call, and all your new LTYM have partners and families, and did I mention you are alone, then you, well, your brain specifically, can make you feel pretty miserable. Until you come across these pictures of all these amazing women. And you realize you could call anyone of them up and they’d meet you for coffee. I don’t know what to say except look. Look what happens when we share our stories. Look how it doesn’t matter if you are a gay butch or a straight high femme. Look what happens when you put together a lawyer, teacher, and a woman who claims anxiety as a hobby. Look what happens when we give each other space to be who we are and we love love LOVE them for it. *And by “we” I really “I.” But if you’re lonely, if you’re suffering from FOMO, may you remember these words, too. 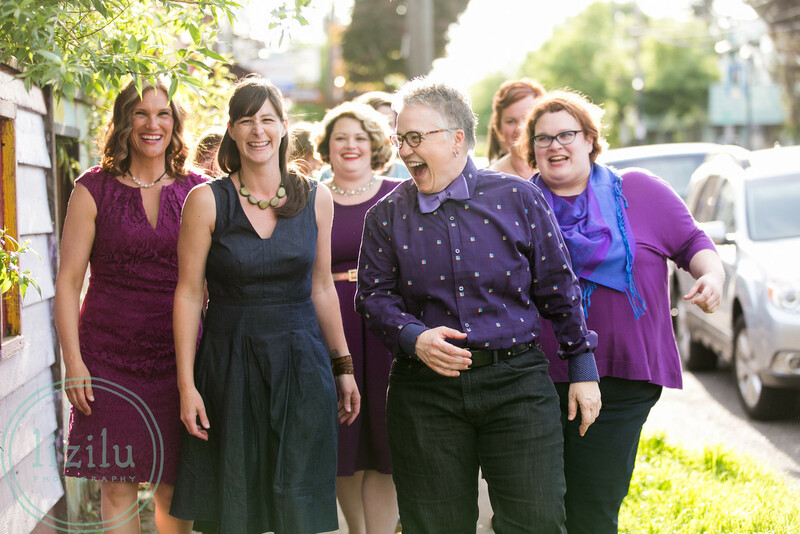 And may you find a group of women who make you laugh like this and feel so loved and accepted (even when yer over in the genderqueer corner with your bow tie and unpainted toenails!). So, when are you going on a book tour?